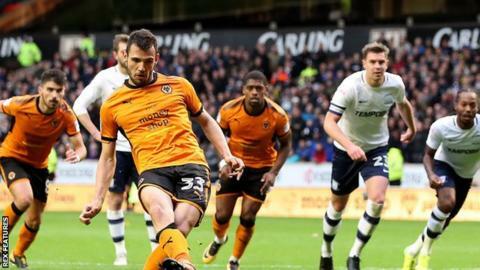 Championship leaders Wolves held off a revival by 10-man Preston to earn another home victory at Molineux. Ivan Cavaleiro gave them the lead when he tapped in Barry Douglas' cross, and Leo Bonatini scored from the spot after Josh Harrop fouled Matt Doherty. Bonatini slotted home his second after Jota's shot was saved by Chris Maxwell but Jordan Hugill headed a goal back and Conor Coady put into his own net. Preston had Alan Browne sent off for a second yellow late on. After a quiet first half, the game opened up after the break and, following Cavaleiro's opener, Wolves loanee Bonatini netted for the third game in a row. Soon after, the Brazilian scored his seventh goal of the campaign to give the hosts what looked like a comfortable three-goal cushion. Preston, who went into the game on the back of a nine-game unbeaten run, set up a tense finale as Hugill and Coady's own goal made it 3-2. A feisty game reached its peak in the closing minutes when Browne dismissed, but Preston could not find an equaliser in the six minutes of added time. Wolves have now not lost at home in their past six games. "Three points is important, but what does not leave us totally pleased is our performance. In the first half, there was too much stopping, too much holding. "Refereeing is difficult and it is unfair for me to judge all the situations, but what I saw was too much holding on our players. He (referee Stephen Martin) must stop this and punish them. It's football, and holding is not part of football. "But we stood up to it. I'm not complaining about the game plan of our opponents. It's our job to find solutions, but there is a referee and we cannot find solutions for holding." "I thought that the penalty was extremely harsh. I have seen it back and there was not much contact. "Then if you look back at the third goal our goalkeeper is clearly impeded and the referee chooses to do nothing about it. "To add insult to injury at the end of the match there is a melee in the middle of the pitch, two of our players get booked, one gets sent off and one of theirs is booked and we have clear video footage that one of their players elbows Ben Pearson straight in the face. "I know it sounds like sour grapes, but I am fed up getting bad decisions against us at times." Match ends, Wolverhampton Wanderers 3, Preston North End 2. Second Half ends, Wolverhampton Wanderers 3, Preston North End 2. Daniel Johnson (Preston North End) wins a free kick in the attacking half. Romain Saiss (Wolverhampton Wanderers) is shown the yellow card. Daniel Johnson (Preston North End) is shown the yellow card. Second yellow card to Alan Browne (Preston North End) for a bad foul. Foul by Alan Browne (Preston North End). Alfred N'Diaye (Wolverhampton Wanderers) wins a free kick in the defensive half. Jordan Hugill (Preston North End) is shown the yellow card for a bad foul. Attempt blocked. Paul Huntington (Preston North End) right footed shot from outside the box is blocked. Corner, Preston North End. Conceded by Rúben Neves. Attempt blocked. Jordan Hugill (Preston North End) right footed shot from outside the box is blocked. Roderick Miranda (Wolverhampton Wanderers) is shown the yellow card for a bad foul. Stephy Mavididi (Preston North End) wins a free kick in the attacking half. Foul by Roderick Miranda (Wolverhampton Wanderers). Tom Barkhuizen (Preston North End) wins a free kick in the defensive half. Substitution, Wolverhampton Wanderers. Alfred N'Diaye replaces Diogo Jota. Attempt missed. Tom Barkhuizen (Preston North End) right footed shot from the centre of the box is high and wide to the right. Assisted by Jordan Hugill with a headed pass. Attempt missed. Bright Enobakhare (Wolverhampton Wanderers) right footed shot from outside the box is high and wide to the right. Assisted by Barry Douglas. Attempt saved. Hélder Costa (Wolverhampton Wanderers) left footed shot from the right side of the box is saved in the centre of the goal. Assisted by Diogo Jota. Foul by Barry Douglas (Wolverhampton Wanderers). Foul by Tom Barkhuizen (Preston North End). Barry Douglas (Wolverhampton Wanderers) wins a free kick in the defensive half. Own Goal by Conor Coady, Wolverhampton Wanderers. Wolverhampton Wanderers 3, Preston North End 2. Substitution, Wolverhampton Wanderers. Bright Enobakhare replaces Ivan Cavaleiro. Substitution, Wolverhampton Wanderers. Hélder Costa replaces Léo Bonatini. Barry Douglas (Wolverhampton Wanderers) is shown the yellow card for a bad foul. Tom Barkhuizen (Preston North End) wins a free kick on the right wing. Paul Huntington (Preston North End) is shown the yellow card for a bad foul. Ivan Cavaleiro (Wolverhampton Wanderers) wins a free kick on the left wing. Attempt missed. Tom Barkhuizen (Preston North End) right footed shot from the right side of the box is close, but misses to the left. Assisted by Stephy Mavididi. Roderick Miranda (Wolverhampton Wanderers) wins a free kick in the attacking half.